Korroke is a very popular snack in Japan. It’s basically a deep fried seasoned mashed potato. This recipe is a request from one of you guys Luis Felipe. Thank you so much! Here I use the leftover from last week’s chicken curry. You can also use meat sauce or cooked minced onion and ground beef. 1) First, peel the potato and cut into an-inch chunks. Soak in water for a couple of minutes to remove excess starch. 2) Transfer to a frying pan and cover with water. Add a pinch of salt and start heating on medium heat. Put the lid on and cook for 10 minutes or until done. Meanwhile, let’s make the breading batter. Crack one egg in a medium-size bowl. Add in flour and water to make a smooth mixture. Set aside until used. 3) Mash the potato well. Add in leftover curry and mix well. The reason why I used the frying pan is for easier handling. The consistency is not too loose, not too stiff. Just like this. If the mixture is too thick, the final product will be dry and it doesn’t taste good. And if the mixture is too soft, it’s not suitable for frying. The consistency should be like regular mashed potato. 4) Transfer to a shallow container, even the surface. Chill at least one hour. 5) After chilling, it should be easy to handle. Divide into 8 and shape into oval. Today I made tiny balls for my son’s bento lunch. Dust with flour all over the surface. 6)Coat with breading batter generously, then bread with Panko bread crumbs. Squash a little bit and set the Panko securely. If you are not sure about the breading is good or not, you can doube the dredge. As you can see, dredge breading batter with right hand, squash panko with left hand. You don’t have to dredge your fingers! 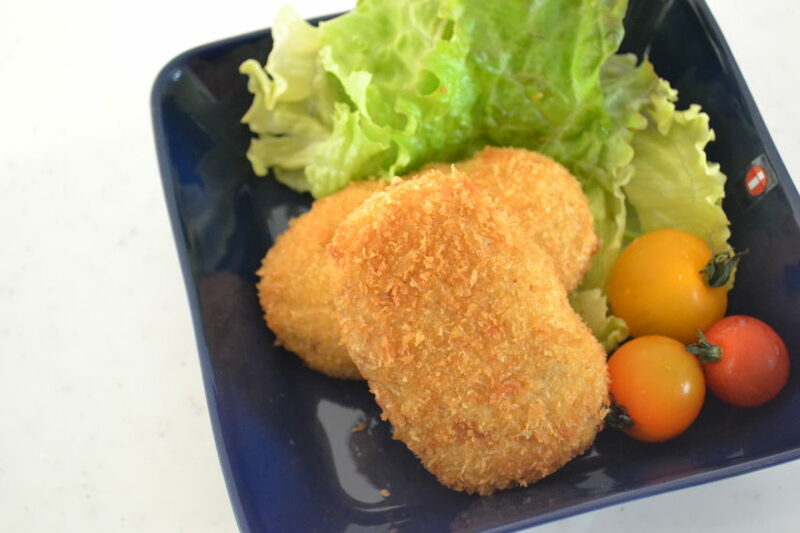 7)Heat the oil for deep frying to 180 ℃ （350°F) and deep fry your croquette for a couple of minutes or until golden brown. You just need to cook the outside. And it’s done! Crunchy on the outside, soft and creamy inside. You have to have it while it is hot but careful not to burn your mouth! 8) Here is a recipe for leftover breading batter. Mix Chinese garlic chives and kimchi. Heat the frying pan and add in a tablespoon of sesami oil. Panfry on medium heat until cooked. There you have an easy kimchi pancake! You can replace garlic chives with carrot or onion, anything you want! I don’t like to waste anything! Today we made curry croquette and kimchi pancake. I hope my recipe is helpful for you!